Good Morning. I would like to also say Thank you very much to the 4th Degree Knights of Columbus Color Guard for being here today and celebrating this special Mass with us. My name is Tommy Goodson and I have the privilege of being Grand Knight or leader for our Knights of Columbus council here at St. Mary’s. We are here today to remember and honor our fallen brothers in the Knights of Columbus. We celebrated in their accomplishments while they were with us and we stand by their families now that they are gone. We are all joined through the unity of fraternity and charity and our mission is to help those in need, especially our widows, orphans, and priests. This is not a task that is taken lightly. It was on this day, 15 years ago, that our country lost many friends and loved ones, sisters and brothers, mothers and fathers, sons and daughters. 45 of those lost that day were members of the Knights of Columbus. They were firefighters, police, EMT’s and from many other walks of life, each dealing with an impossible situation and helping as they could. Immediately after the attacks on September 11, 2001, the Knights of Columbus, Supreme Council went into action by creating the “Heroes Fund” and donating more than $1.5 Million dollars to the families of the fallen first responders, regardless of their religion. And in 2004, by resolution, declared September 11 to be a World Day of Prayer for Peace, asking us all to remember and to pray for peace everywhere. So it is only fitting that on this day of remembrance and reflection, we recall our brothers and friends who have now fallen asleep. These are the men who stood shifts to solicit donations for our LAMB (Least Among My Brethren) drive so we could help the teachers of our special needs children in our community, who worked to maintain the grounds of our church to keep it beautiful, and who always jumped in to help anyone whenever and wherever help was needed or asked for. We will remember our fallen brothers always, in our hearts, thoughts, and prayers. I would like to ask all who have served in the military or as a first responder (police, firemen, or EMTs), past or present, to please stand. I would like to say Thank you to you all for your service and selfless sacrifices that you make for us and our safety! Now I would like to ask that all the Knights of Columbus present to please stand. 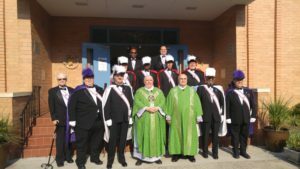 As you can see, some of these men not only serve our communities and country, but they choose to continue their work as a Knight of Columbus. These are the men who carry on in the place of our fallen brothers and continue the work that they started. I would ask that if you are not a member, please consider talking to one of these men you saw standing to learn more of what the Knights are all about. And so in closing, as we all go home today, please keep our fallen Knights and these men and women in your prayers and pray for our world leaders that we may find peace in our time. God of peace, bring your peace to our violent world: peace in the hearts of all men and women and peace among the nations of the earth. Turn to your way of love those whose hearts and minds are consumed with hatred, and who justify killing in the name of religion. God of understanding, overwhelmed by the magnitude of this tragedy, we seek your light and guidance as we confront such terrible events. Grant that those whose lives were spared may live so that the lives lost may not have been lost in vain. Comfort and console us, strengthen us in hope, and give us the wisdom and courage to work tirelessly for a world where true peace and love reign among nations and in the hearts of all. Copyright © 2019 Knights of Columbus - Garner, NC.